The capability of enterprises to form network organizations (Virtual Enterprises) and cooperate with partners is an important factor for a competitive market position. The information and knowledge exchange between partners play a critical role for the success of such networks. It is of biggest importance to have an optimized information flow to find the appropriate knowledge source in the desired quality and in adequate time. In current networked organizations it is usually not transparent to the partners, which knowledge is available at which partner's site. Our approach is to use semantic technology together with software agents in order to improve knowledge capturing, knowledge reuse, and knowledge transfer. The software agents are used within a complex virtual company to control certain components and processes (domains). 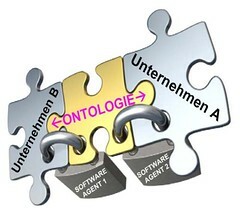 Semantic means in this context, that all relevant concepts important for SMEs will be modelled into an ontology by capturing the associations between the domains, ensuring at the same time the understanding of exchanged knowledge during the inter-agent communication. This allows business partners to build open communities that define and share the semantics of the information exchanged in their domain. The development of an ontology for the most SMEs is still not very common, as many companies hesitate to start this resource-intensive process. The goal of the project is to develop and implement the concepts for the applications of the semantic and software agent technologies in particular SMEs and to present the best practice as well.